Law enforcement personnel at all levels serve on the front line of America’s Global War on Terrorism (GWOT). In the interest of national security and public safety, law enforcement investigators frequently must question persons, either for purposes of intelligence gathering, for collecting evidence that may lead to prosecution and take immediate action that may be in the interest of the public safety/force protection. The objective of these interviews/interrogations is to gather accurate and reliable information that furthers security, safety, intelligence, and law enforcement interests. The current threat environment, however, poses some new challenges for professionals conducting terrorism investigations. 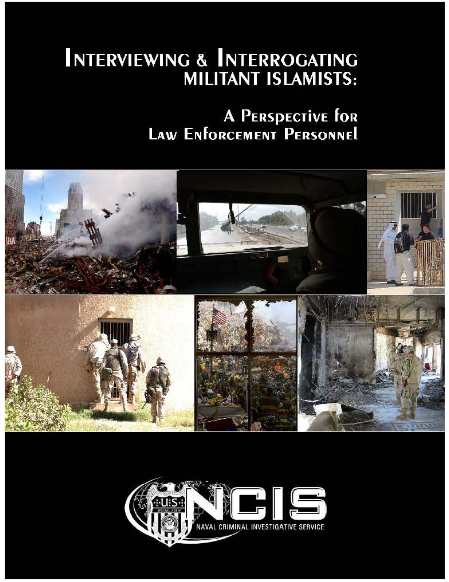 Many of the “enemy” in the GWOT have beliefs, ideologies, cultures, and life experiences that differ markedly from those of their interrogators – and often differ from those of criminals with whom law enforcement professionals more typically interact. Terrorist groups and networks of militant Islamists (often affiliated with al Qa’ida) pose ominous threats to U.S. interests and present enormous challenges to investigative and intelligence personnel who pursue them. These militant operatives are committed to a cause. They act not just on their own personal interests, but also in the interests of the “brothers” (group) or of “Islam.” Unlike most typical “street criminals,” they may be trained to withstand questioning and to utilize counterinterrogation techniques. Clearly differences exist between subjects of al Qa’ida-related terrorist investigations and subjects of other investigations more commonly conducted by law enforcement. This paper seeks to highlight some of these differences and to provide some suggestions, based on experience, about how best to deal with them. First, the paper offers background information and context for interrogating Middle Eastern Arab militant Islamists as subjects of investigation. Our general recommendations may even be limited to that group, as cultural considerations may vary for non-Arabs and Islamists from other areas of the world (e.g., Southeast Asia). Second, the paper summarizes what has been learned about general interview approaches used immediately after capture and during subsequent detention. Third, the paper recommends ways to design and navigate interviews: preparing, developing rapport, developing themes, managing resistance, and detecting deception. To state immediately the central theme of this paper: a relationship/rapport-based approach with Middle Eastern Arab subjects who may be affiliated with al Qa’ida or other militant Islamist networks will result in more truthful and reliable information than will an aggressive approach. Aggressive and forceful interrogation of a subject who may be trained to anticipate torture and to resist questioning is likely counterproductive to the goal of eliciting accurate, reliable and useful information. 3. the degree to which the subject needs (or may be influenced to need) to sustain a position of respect and value in relation to the interrogator, especially in a relationship-based interrogation. These three influences can be leveraged over time to elicit more information from the subject and to develop leads that corroborate the subject’s story and yield additional information. Developing rapport involves more than simply “being nice” to a subject or giving him what he wants just to gain information. It requires a series of give and take interactions, under circumstances controlled by the interviewer. The interrogator needs to engage the subject in an extended conversation and to develop a relationship that helps to provide insight into the subject’s motivations and deceptive practices or resistance techniques, so as to promote collection of accurate information. To build rapport, the interviewer engages in dialogue with the subject, during which he or she identifies and assesses potential motivations, interests, and vulnerabilities. Rapport is based on a quid pro quo (the perceived ability of an interviewer to help the subject), commonalities (family, wife, education, adversity), personality, and mutual respect. Often rapport-based approaches include adversarial arguments, disagreements, admonishments, criticism, and challenging questions. These are always tempered with the fact that the subject knows that interviewer is concerned about his future and is fair to him. In a rapport-based interview process, the interviewer leverages the relationship, using a variety of interpersonal, cognitive, and emotional strategies and techniques, to elicit critical information from the subject. The subject shares information with the interviewer because his collaborative relationship with the interrogator leads him to value the relationship more than the information he is trying to withhold. If for example, the subject is an Arab and comes from the Middle East, he likely has been raised in a culture where relationships are critical and shame is a key behavioral driver. In this culture, there is little individualism; the way the subject behaves and interacts with others defines who he is. Therefore, to access information of value, the interrogator must develop a connection with a subject and build a relationship. This takes creativity, flexibility, and versatility by the interviewer, not a textbook “today we will use this technique,” mechanistic approach. The tone and approach of the interrogator may change during the course of a given interrogation based on cues from the subject and opportunities that present themselves. If rapport develops between the interviewer and the subject, the subject has motivation for cooperating and ultimately sharing information. Development of rapport takes time and can be a long and tiring process. The interviewer needs to be prepared and to keep his or her eye on the goal: development of a relationship in which the subject views it as more important to preserve the relationship than to withhold information.